Blogging has been swamped lately by that miracle called life but I could not help but be drawn to a paper in this week's Science which describes a most unholy and unexpected stabilizing alliance in a protein's innards. Proteins are known to form cross-links such as disulfide bonds to stabilize interactions with ligands and substrates. Any reasonable chemist would expect these kinds of interactions to be mediated between polar residues. But nature usurps us low-lifes once again. In this week's Science, a group led by Andrew Karplus reveals a stabilizing covalent cross-link between, hold your breath, a valine and a phenylalanine. Who could have imagined these two otherwise blissfully aloof and stable partners suddenly deciding to...bond? As chemists know however, there is only one kind of chemical entity that can create such havoc with stable functional groups- a metal. It turns out that the protein is a four-helix bundle diiron protein with two Fe atoms bound in proximity to the Val and Phe. The two irons apparently create their own cofactor by neatly supplying electrons to bond the Val and Phe to each other and molding a cosy bed for themselves. The resolution is 1.2 A so the electron density is unambiguous. 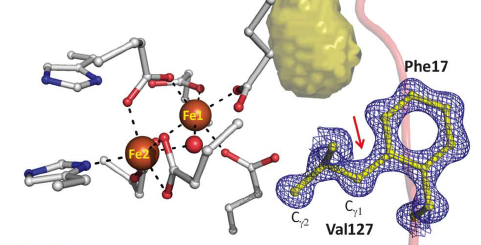 The function of the unusual cross-link seems to provide a barrier to protect the iron from potential iron chelators; experiments indicate that the iron is rapidly mopped up by chelators in mutants lacking the cross-link. Intriguingly, the real function of the protein itself remains unknown. Organometallic chemists who are keeping the midnight oil burning trying to use metals to functionalize unreactive C-H bonds would not be too surprised that a metal is mediating such strange interactions. But the observation demonstrates something that chemists are all too familiar with by now- Nature has been there, and it's done that. whaaaat? That's some C-H activation.